On Friday 7th September, 42 6th Formers from Greenwood Academy started their new academic year with a bang! With the support of Aimhigher+, Year 12s kicked off their first day with a study skills session that gave tips and emphasised the leap from GCSE to A Level study. Whilst over the corridor, Year 13s were getting their heads around Personal Statements with a workshop which included them all brainstorming their first drafts. After these workshops, all pupils joined the coaches and travelled to Ackers Adventure where the fun stepped up a notch! 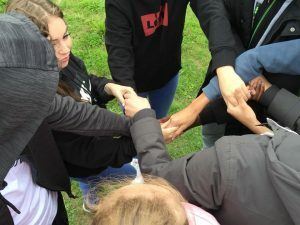 First, Y12 and Y13 were randomly split into teams and then made their way to the activities field where they completed various challenges as a group. Grace, a Year 12 student, said ‘To be fair, that was really good as I only knew about 3 people before then and now I know loads’. Tasks required effective communication, time management, sometimes leadership and always, teamwork. After lunch, all 6th Formers took part in either archery or zip-wiring – choices which were both selected by an in-school vote. Again, pupils had to work with people that hadn’t before, and support one another to achieve, particularly when it came to the scary heights of the zip wire!